The story behind Ford's self-driving car plans; will they go public? 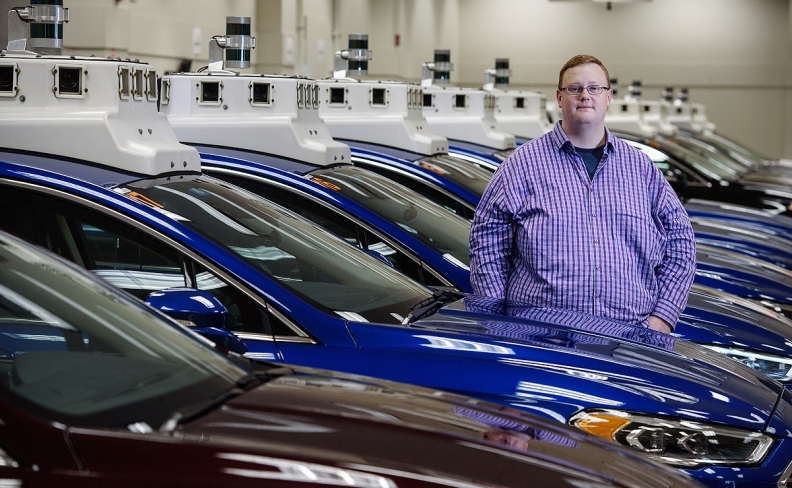 PITTSBURGH -- Bryan Salesky has been entrusted with $1 billion by Ford Motor and given a mission to bring the pioneering American automaker into the age of driving robots. All that money to figure out tomorrow from a company feeling more than a little insecure about its present comes with an unavoidable psychic weight. It becomes top of mind when Salesky looks down at the floor. The investment in Argo AI, a self-driving startup, is Ford’s way of trying to catch up to Google affiliate Waymo and General Motors in the driverless derby. Ford took a majority stake in Argo last year and expects to deploy autonomous vehicles running its system in a money-making business by 2021. But this move to make up for lost time in next-generation technology comes as Ford is beset by plunging profits, investors stampeding out of a stock that has fallen 23 percent this year, and a credit rating that’s now one step above junk. Wall Street is openly questioning the leadership of CEO Jim Hackett, after only 16 months on the job, and predicting the dividend will be cut. The whirlwind formation and funding of Salesky’s 22-month-old company is grounded in an epiphany he had while engineering Google’s earliest self-driving prototype: Silicon Valley cannot realize the dream of driverless cars on its own. It needs the help of a “legacy automaker,” as old-line automakers are disparagingly known in tech world. Salesky is now determined to ensure an American automaker becomes one of the power players. Since the Ford deal, Salesky and Rander quietly built up a team of 330 people and deployed squadrons of driverless Ford Fusions in three U.S. cities. It’s an impressive achievement in a short time. But his main rivals, Waymo and GM, have been at it longer and are farther along. Since Waymo began life in 2009 inside of Google, it has logged more than 9 million miles of on-road testing in 25 U.S. cities. Argo’s vehicles have driven a fraction of that, although the company does not reveal specifics. This gap can also be mapped financially. GM’s self-driving unit, Cruise, landed a $2.25 billion investment in June from Japan’s SoftBank, boosting the automaker’s stock and credibility. Waymo, meanwhile, has a deep-pocket parent company in Alphabet. Argo is not set up like Cruise to take on Softbank-sized capital. Instead, Salesky says he is seeking investment by finding additional automaker customers besides Ford. Without Google-sized money of its own, Ford decided over the summer to open the door to outside backers --and the legitimacy that goes with big investments -- by creating a freestanding autonomous vehicles unit. Over the next five years, Ford said it is investing $4 billion in the group to develop self-driving cars and new mobility businesses, and to harness big data to provide new services in cars. But Argo remains the crown jewel of Ford’s autonomous investments, which is why Hackett brought the automaker’s board to Pittsburgh this month to visit Salesky’s new headquarters and ride in Argo’s self-driving cars. Hackett, in an interview, speaks enthusiastically about the way Argo vehicles navigate around parked cars on narrow city streets and how the startup’s open, airy offices will attract hard-to-get tech talent. Self-driving cars are expected to upend the transportation industry and become a business worth $7 trillion by mid-century, according to a report last year by Intel and Strategy Analytics. Automakers who get it right -- whether by developing their own technology or forming alliances with Silicon Valley -- will be on track to more than double the industry’s meager profit margins and build a more prosperous future. But those who fail may not have a future at all. Down below on the streets, rotations of robot Ford Fusions continuously circulate in this neighborhood teeming with bicyclists, runners and pedestrians popping out along every block lined with hipster coffee shops and lunch joints. Argo’s driverless cars are also running the roads in Detroit and Miami, where they are testing driverless delivery of pizza with Domino’s and groceries with Postmates. When he is not fixated on the modest cost of his drab office floors, Salesky shows little outward sign of feeling any pressure. But you can rile him up by asking why Argo and Ford appear to lag behind what Waymo and GM are doing on the open road. Ford’s plan, Salesky argues, is far grander and will involve up to 100,000 self-driving cars -- with no steering wheel, accelerator, or brake pedal -- operating in multiple U.S. cities, delivering people and packages around the clock. To demonstrate that Ford is further along than people think, the normally media shy Salesky has begun to emerge from the shadows and share his story. That could also include going public. “We’re actually thinking about an IPO and making sure that we’re setting the company up for that,” Salesky says. A public stock sale does not require winning a second automotive customer, he adds. All this began in a booth in a dark corner of an Italian restaurant in Pittsburgh two years ago when Salesky shared a secret with Rander, a mentor who gave him his first job in robotics at Carnegie Mellon University. Salesky told him he had never felt at home in Silicon Valley, and now he was ready to leave Google and strike out on his own. Rander surprised his protege by disclosing the same thing. At the Darpa Urban Challenge, the foundational contest for today’s self-driving brain trust that was funded by the U.S. Defense Department in the mid-2000s, Salesky started a life-changing friendship with Chris Urmson. The two later bonded on eight-hour car rides to Peoria, Illinois, where they created massive self-driving mining trucks for Caterpillar. The self-driving car managed to safely handle one of those potentially risky what-if scenarios being drawn up by Argo’s engineers. While making a right turn near a take-out restaurant, a young woman looking at her phone stepped directly into the path of the Argo car. The robot hit the brakes so quietly and quickly, the jaywalker did not even look up.